Members: John Foster, Michael Howard, Fr. Tom McHale, Fr. Chris Warren, Elaine White, Paul Young, Sr. Patricia Bell, Maria Matthews and Fr. Dermott Donnelly. Address: Emmaus Youth Village, Pemberton Rd, Allensford, Consett, Co. Durham DH8 9BA. Social Media: Facebook, Twitter (@ymteam) and YouTube. The Diocesan Youth Ministry Team (YMT) aims to bring young people into a personal relationship with Christ and fully into the life of the Church. They do this through a strategy of Missions, follow-up Retreats, and support for Parish Youth Ministry. 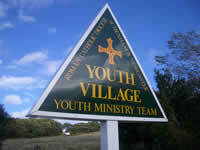 Read more about the Youth Village here. Visit the YMT website for the latest details of upcoming events. The Source Youth event is held 7.00pm until 8.30pm in St. Mary's Cathedral, Newcastle. See the poster with dates and further details.